The Artisanals are exploding onto the scene with their classic 70’s-rock-meets-dream-pop sound, and turning heads with their hair-whipping energy on stage. Within the first year of the band’s formation, The Artisanals received premieres from esteemed publications such as Huffington Post, Paste, PopMatters, and Brightest Young Things for their breakout EP. On the first day of summer, the band will kick off their tour in Birmingham, AL. 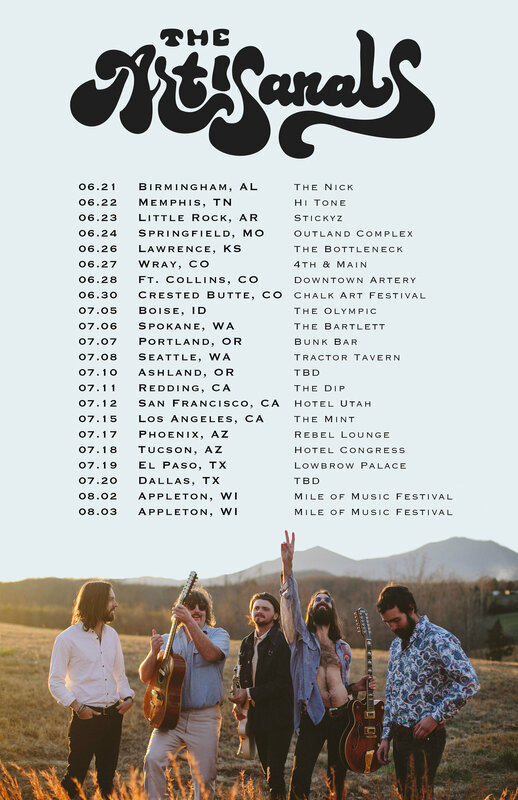 Catch them as they travel through midwestern and mountain states, before heading down the west coast. The Artisanals are a Charleston, SC based band that coalesced in late 2016. Produced by The Artisanals with Wolfgang Zimmerman, their debut EP Literally Anywhere is the first ever record to come out of the Magic Barn--a studio-converted barn in Iowa that was built around the Neve console and gear from New York City's now-defunct Magic Shop Studio. Open from 1988 until March of 2016, the Magic Shop was a sought-after studio beloved by countless legends like Lou Reed and Blondie, for its vintage gear. Arcade Fire tracked The Suburbs there, and David Bowie recorded his last two albums, including Blackstar, at the Soho spot. With sonic influences ranging from the work of George Harrison (“Angel 42”) to the stone-cold radio hits of bands like the Killers (“Roll With It”), Literally Anywhere showcases the band’s knack for writing hooks as well as their ear for quality production. The album utilizes everything from a gong, organ, piano, sitar, French horn, trombone, and koto, to a string section sourced from the nearby University of Iowa. There’s no filler here; from start to finish, this record is a straight banger.